Amazing Investment Property Right on Main Street in Clayton! Beautiful property in the historic district in downtown Clayton. If you know anything about Clayton, you know Main street is the place to be, this property is on Main, less than a 1/2 mile from the center of downtown near the post office. Most of these older homes in the area have been rezoned and have been converted to attorney’s offices, Real Estate offices, Taverns, and other various small businesses. This property is a great opportunity for positive monthly cash flow as office space and high potential for appreciation with minimal repairs & updates. 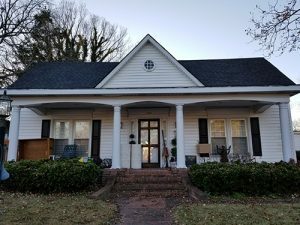 Very good condition: Property has been kept up fairly well, Hardwoods throughout are in good condition, Roof only a few years old. Property needs: Since any tenant would likely build to suit, most of the work would be on the exterior to allow for parking logistics. Interior would need minimal work, removing the kitchen, new fixtures, some drywall & paint. Property is not Currently listed on the MLS, but as a VIP Buyer in the Clayton area you are getting a first right of refusal at a $10,000 discount (it will be listed at $149,900). Just give us the code “VIPClaytonBuyer” so we know you received the card.